Holy Bat Mobile! 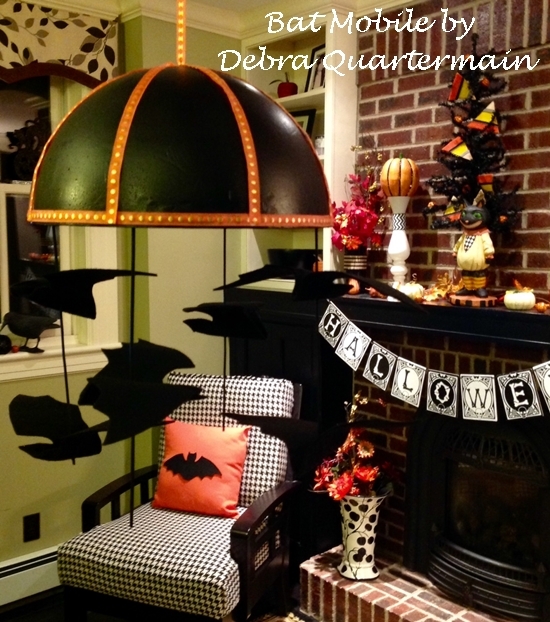 Not exactly the famous batmobile of Batman and Robin, but a perfect project for striking Halloween home décor. It’s quick and easy – you can have it hanging before the little trick-or- treaters stop by tonight. Happy Halloween! 1. Paint the skewers and the half-ball black, inside and out. Set aside to dry. Glue ribbon in stips as shown. Finish the edge by gluing a ribbon around it. 2. 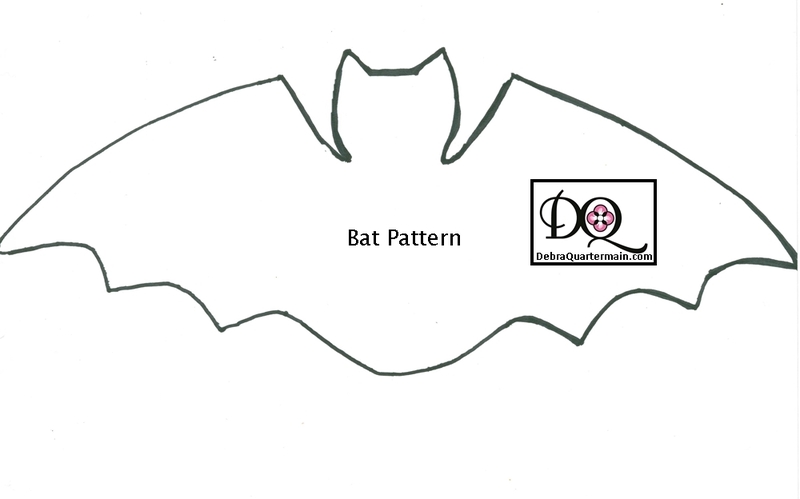 Print and cut out my bat pattern (click here) – then mark and cut out six bats from the felt. 3. Make a small hole in the center of each bat and insert a skewer. Put two bats on two of the skewers and one bat on the remaining two skewers. Squirt a line of glue along the center of each bat and press in half to glue skewer in place. 4. Make a hole in the center of the top of half-ball. Cut an 18” length of ribbon, thread it through a button and tie a knot to secure. Pull the ribbon through the hole in the half-ball and pull it up so the button rests snugly agains the inside. 5. Poke pilot holes with a skewer, evenly spaced around the rim of sphere. Glue each bat skewer in place. After taking the pictures, I decided to trim off the skewers that had only one bat, to make them look like they are flying. I admit to having had some trouble with this design. Originally I envisioned the bats hanging from ribbon but I could not get them to balance, my mobile hung crookedly. There is always a creative solution and so the skewers worked perfectly. What I also discovered was that this is very cool when hanging from a ceiling fan blade put on low speed so the bats look like they are swooping around the room. Also make sure to hang it high enough above anyone head. 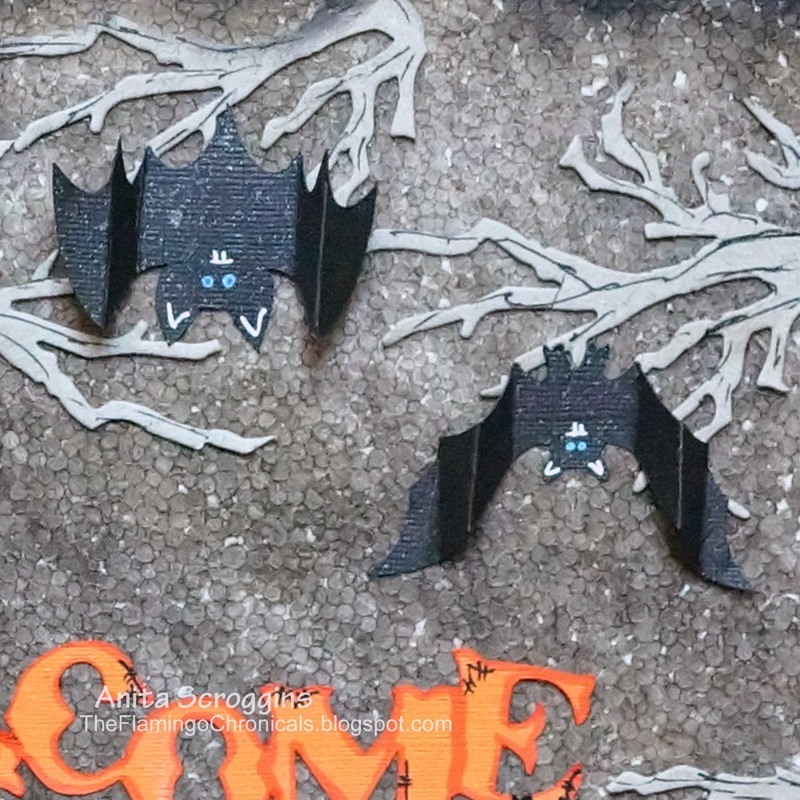 Today I want to share a fun Halloween project to hang on your front door! 1. Paint the Smoothfoam sheet black, and remove some of the paint with a baby wipe, let dry. Smudge light gray on top and blend in to get a foggy nightime look. Let dry, then darken the edges with black ink. 2. 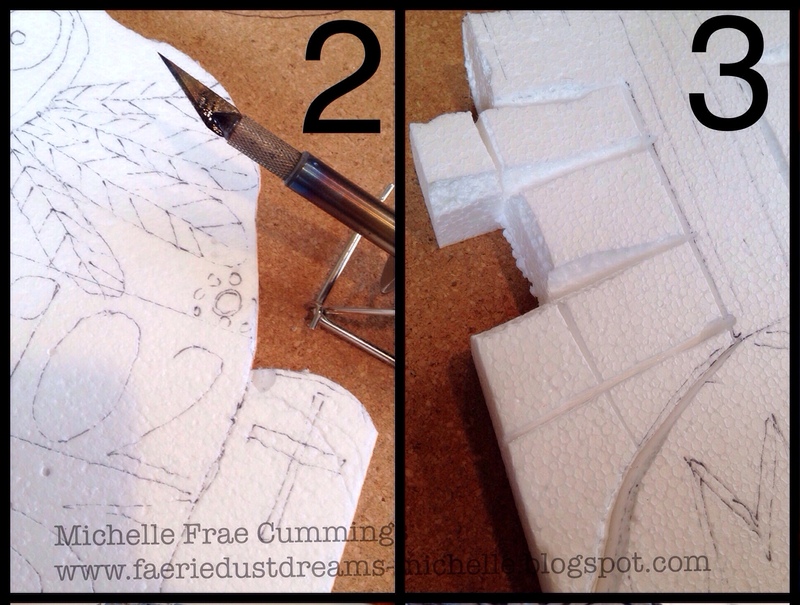 Ink the edges of the chipboard branches and glue to the top of the sheet – add details to each branch with a marker. 3. Add outlines or details as desired to the die-cut letters or stickers with a paint pen, then adhere the phrase in the center. 4. 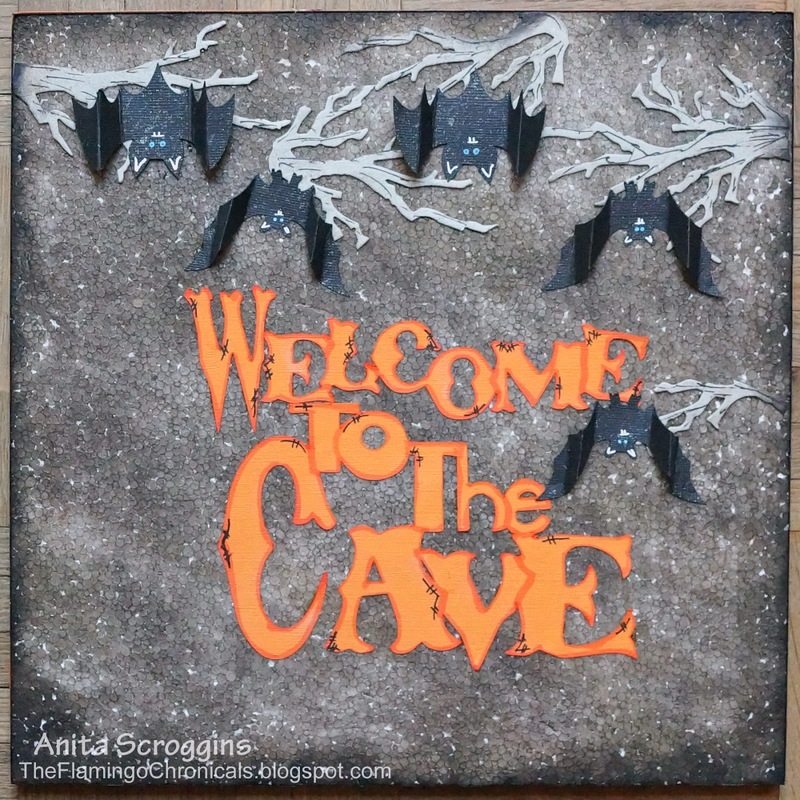 Cut bat shapes from black cardstock, add facial details with paint pens, fold the wings as shown and glue them upside down to the branches. For the doll head, poke in a wood skewer for a handle and paint the face in Flesh Tone. Paint the eye sockets Soft Black and let dry. Fill in the eyes with Warm White; leaving a rim of black around them. Paint the iris of each eye in Traditional Raw Sienna and let dry. Dot the pupils with Soft Black and a White highlight. Use liner brush to apply Raw Sienna eyebrows and use the marker to make eyelashes. Paint her hair with Traditional Raw Sienna and use a smaller brush to feather the hair around the face. 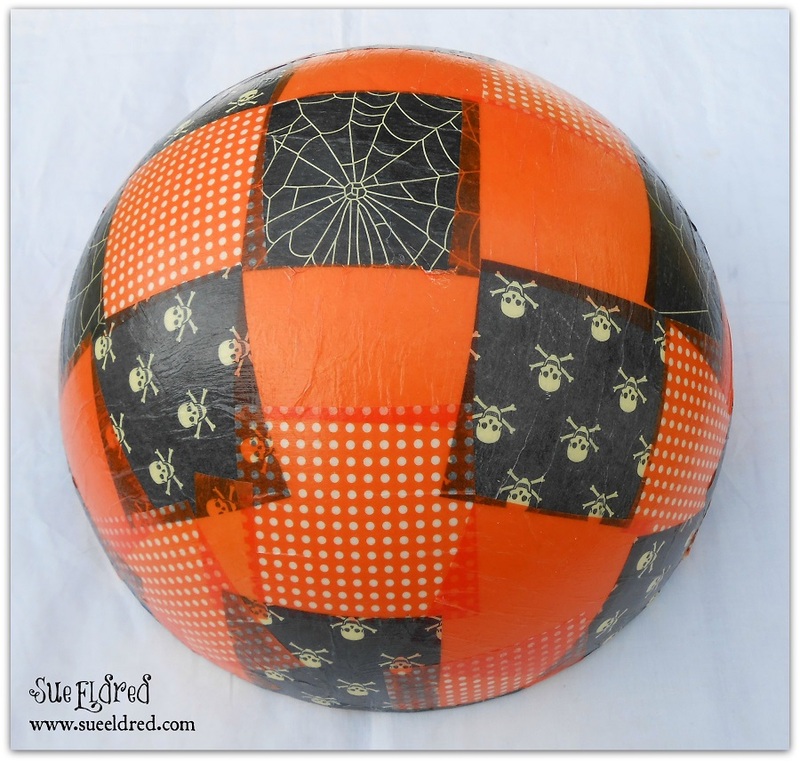 For the jack-o-lantern, paint one 4″ ball with Georgia Clay and let dry. 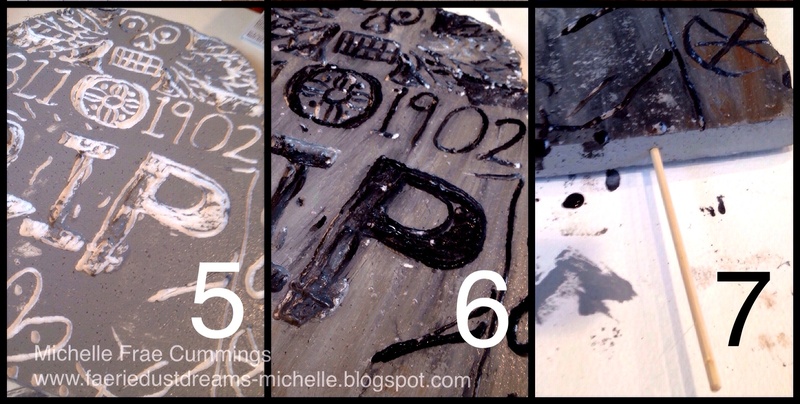 Blend one part Black to 4 parts Georgia Clay and paint lines from top to bottom of the jack-o-lantern and let dry. Paint the face cut-outs with Soft Black, let dry, then highlight with White using the liner brush. For the base, cut both ends off of the second 4″ ball, leaving it 2-1/2″ high. Use a skewer for a handle and paint with Spiced Pumpkin. Use a toothpick to connect the head and collar to the jack-o-lantern, then add some glue near the toothpick to secure. Glue the hat to doll’s head and tie a piece of tulle around the base of the cone top. Poke 5″ of a wood skewer into the flat top of the base to make a pilot hole. Poke the opposite end into the bottom of the jack-o-lantern. Insert the skewer back into the base. This will allow the jack-o-lantern to swivel around on the base. Center and glue the Smoothfoam ring to the bottom of the 12″ half ball for the bowl. 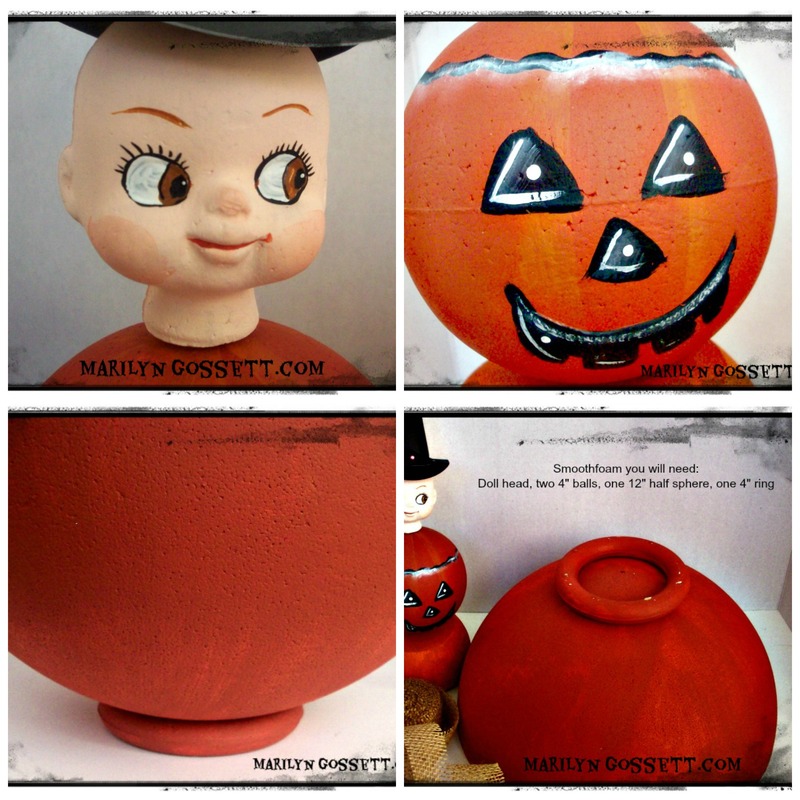 Paint with Georgia Clay and paint lines on the bowl in the same way as the jack-o-lantern. Allow to dry thoroughly. Glue the burlap trim around the top edge of the bowl. 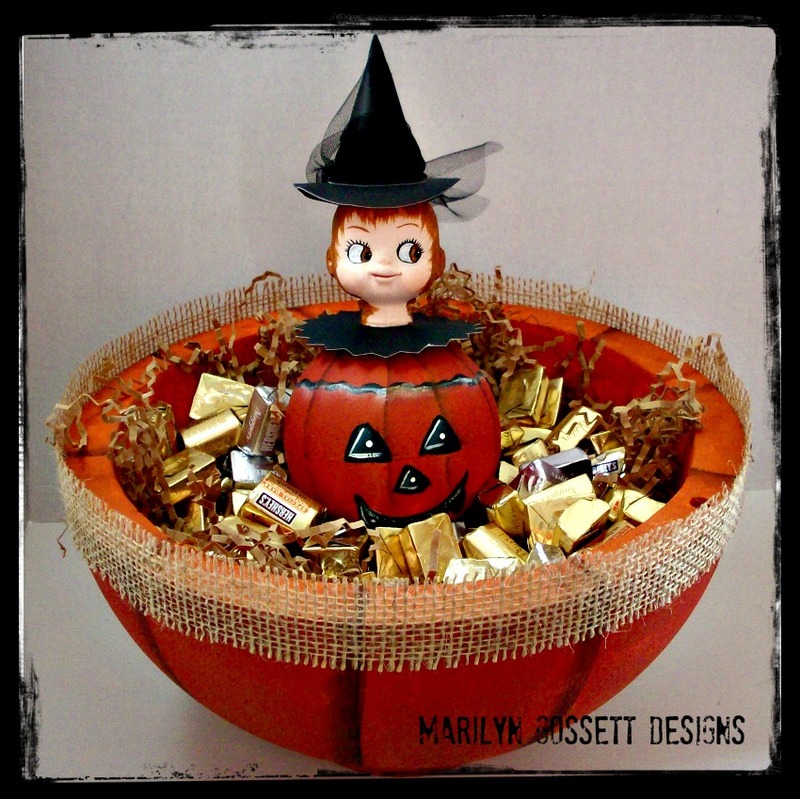 Set the Jack-O-Lantern Doll into the center of the bowl. Toss your candy in the bowl to fill it up. Enjoy…Happy Halloween! I have always used a glass mat when cutting anything with a craft knife because I like the way the point of the knife slides easily along the glass. A craft knife works well for ½” sheets – make sure it’s sharp. 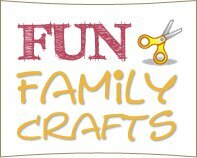 Children can use a safer plastic craft knife – rub wax along the edges to make the cutting easier. 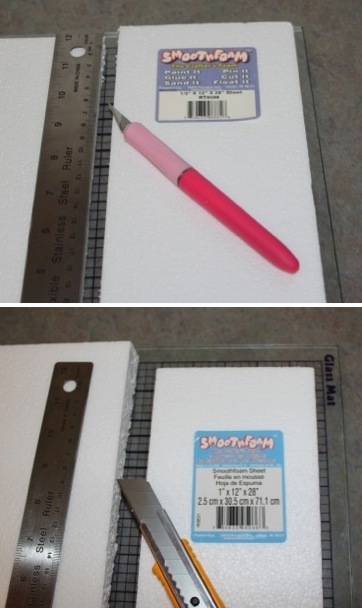 Cut the 1″ thick sheets with a utility knife against a metal ruler. The blade on a utility knife is longer and it can go through the Smoothfoam with one pass, leaving a clean edge, whether I’m cutting straight lines or basic shapes. If you end up with small burrs (foam particles) on the edge after cutting, gently rub the edge against another piece of Smoothfoam to remove them – it works as a sanding block against itself. This may also be a sign that you need a new blade for your knife. 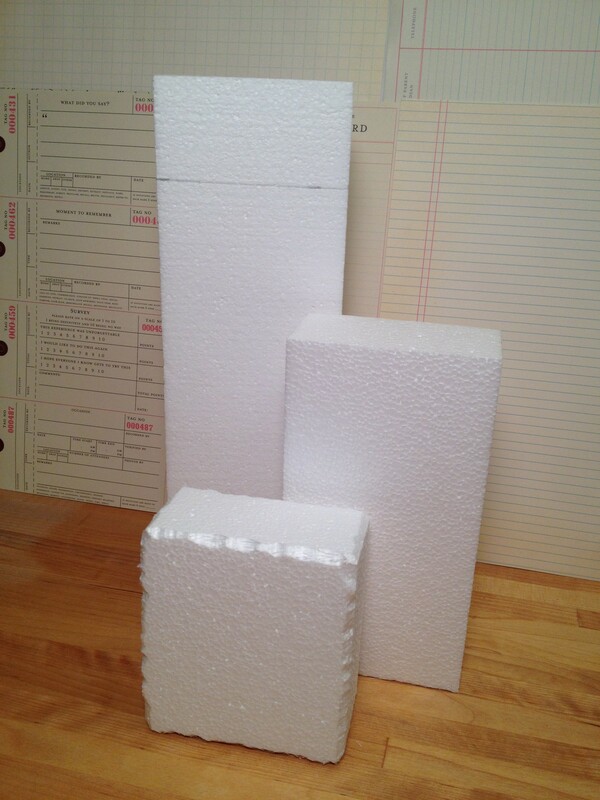 For Smoothfoam blocks, balls, and other dimensional shapes, a craft hot knife works the best. Of all the holidays, Halloween has always been my favorite! I love to dress up the house in preparation for trick-or-treaters. 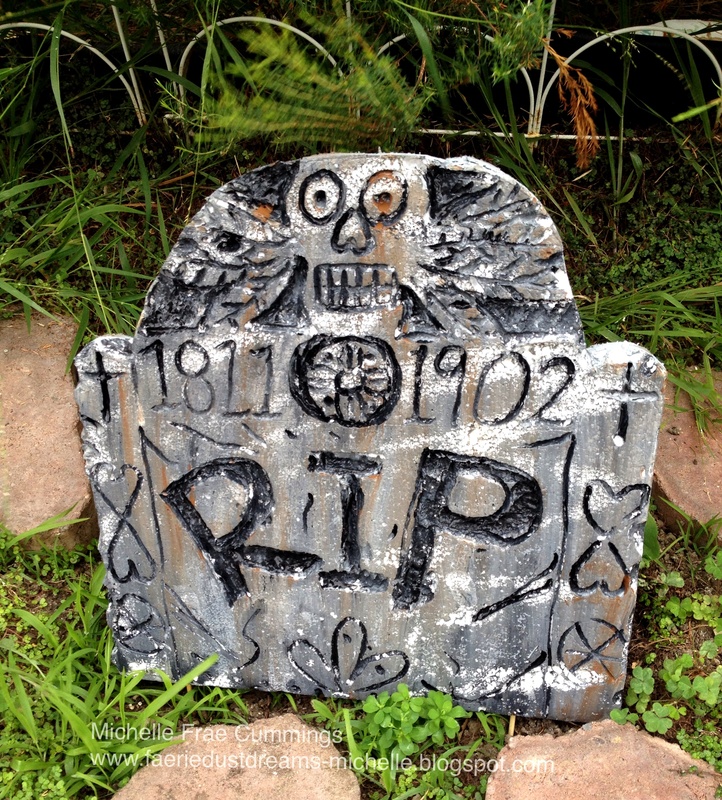 This year I thought it would be fun to try making some new tombstones to add to my store-bought collection. You can use the tombstone-shaped Smoothfoam for this project or shape them yourself from plain sheets. 1. 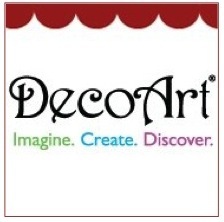 Sketch your design onto your Smoothfoam sheet. Don’t worry if you make a mistake, this will be covered up later with paint. IMPORTANT: Always work outside or in a well-ventilated area when heat-carving Smoothfoam, and be mindful of where you set the heated tips. 2. Attach your hot knife tip to your wood-burning tool and begin to carve away the outer shape of your tombstone. 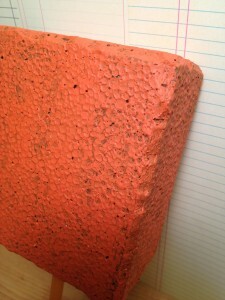 You can also carve away at the edges so it will look like chiseled stone. The hot knife cuts through the Smoothfoam like butter! 3. This Smoothfoam sheet was easy to trim as it was thin. The other shapes were thicker so to remove unwanted smoothfoam without damaging the design, I scored the pieces that needed to be removed first. Then I snapped them off and cleaned up any rough edges with the hot knife. 4. Unplug the wood burning tool and let it cool completely before changing the knife tip to the tapered point, then begin carving out your design. Start at the top and work your way down. 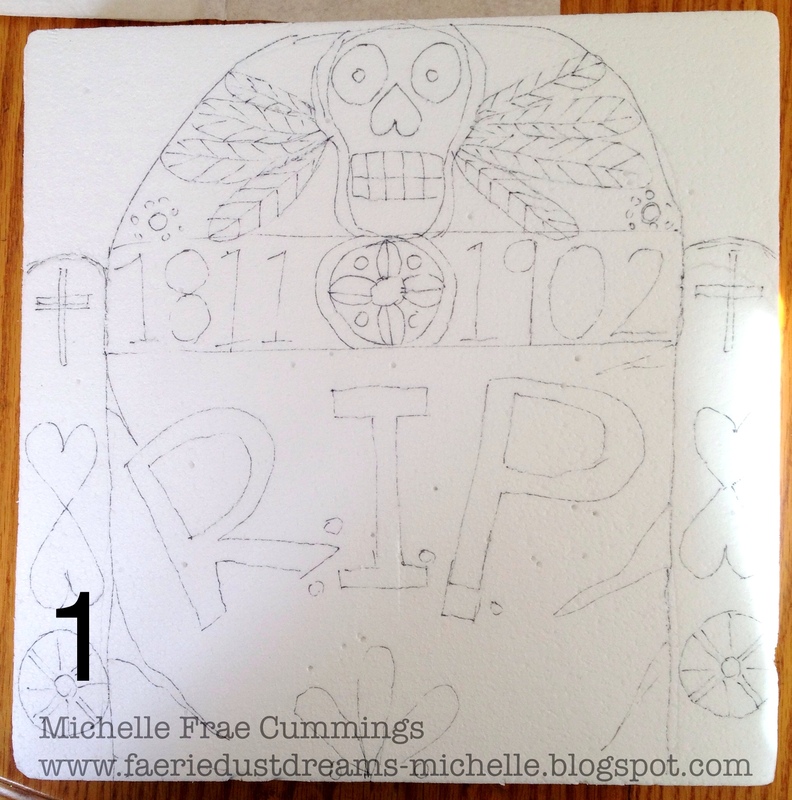 It’s a fairly quick process and any carving mistakes only add to the charm of the tombstone. 5. When you have finished carving up your stones, it’s time to paint. Plan to use the same palette for all the colors, as the mixing really adds to the overall effect. Paint the front, sides and back gray paint. Don’t worry if the front is not dry before moving onto step #6. 6. Starting from the top, fill in the carved-out designs with black paint using your small flat paint brush. Its OK to be messy when trying to get paint into all the grooves, designs and letters. As you finish each part, use the baby wipe to clean up excess paint by wiping ‘downwards’. This will smear some of the black paint for a distressed look. 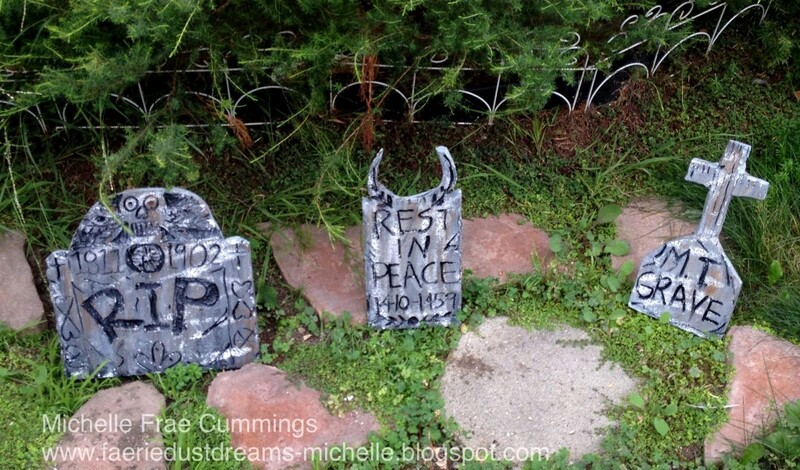 Next, add some brown to the surface by dragging a baby wipe with paint from top to bottom to make the tombstone look like it’s weeping rust and graveyard dirt. Apply as much brown as desired. Too much? Just wipe it off before paint has dried. 7. 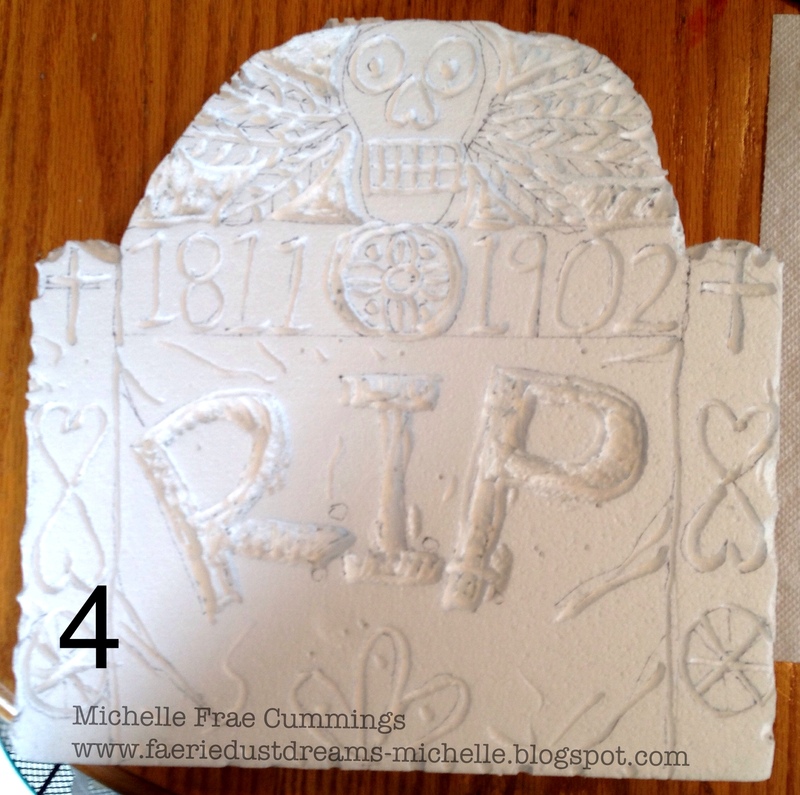 Wait for tombstones to dry, then gently sand the edges if you want to distress further. Gently push the bamboo skewers into the bottom of the tombstones, about a quarter of the way in, then press into the ground in your yard. The skewers help keep the tombstones from toppling in the wind. Add some fog and special lighting. Now you are ready to welcome all on Halloween night! I’m not usually into doing creepy crafts for Halloween, but Smoothfoam’s baby heads inspired me to get spooky this year. I’ve seen spooky dolls around online, but using the foam doll heads makes this craft quick, easy and inexpensive. Learn how to make these creepy Halloween doll heads below. Paint the doll head with a light coat of gray paint. While the gray is still wet, paint the eyes, mouth and ears of the doll head with black, then wipe the head with a paper towel to smudge some of the black into the gray. Set aside to dry. 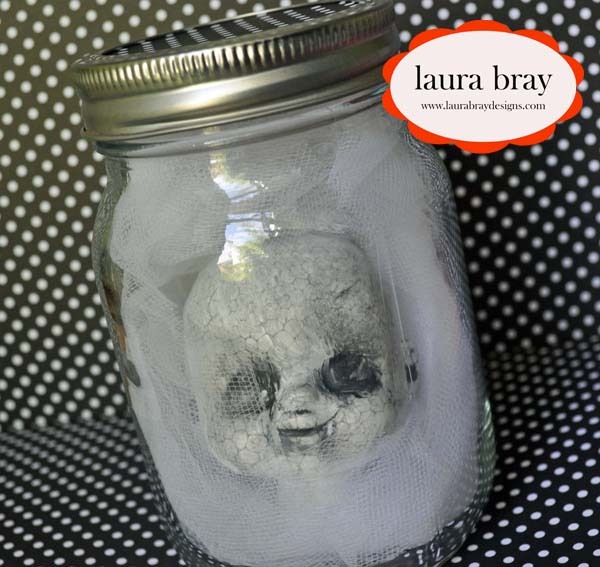 Fill the mason jar with tulle and tuck the painted doll head into the jar. 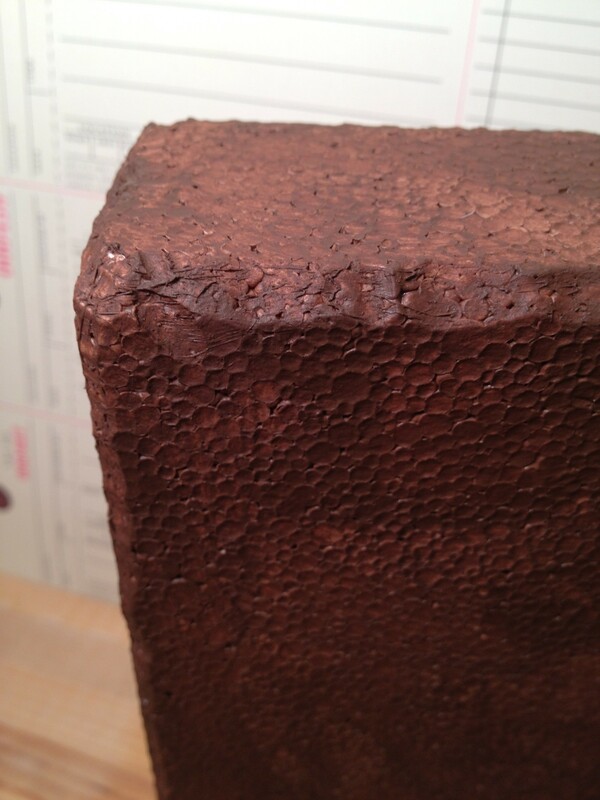 The texture of the Smoothfoam highlighted like this is so perfectly creepy, isn’t it? 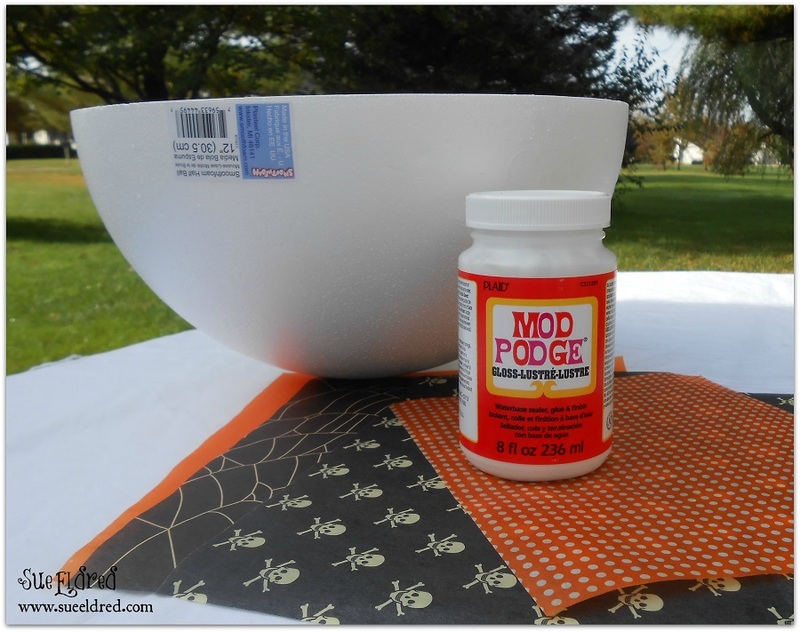 Find numerous homemade Halloween crafts in the Smoothfoam blog. We are about to hit 1000 fans on our Facebook page, so we want to thank our fans with a giveaway! 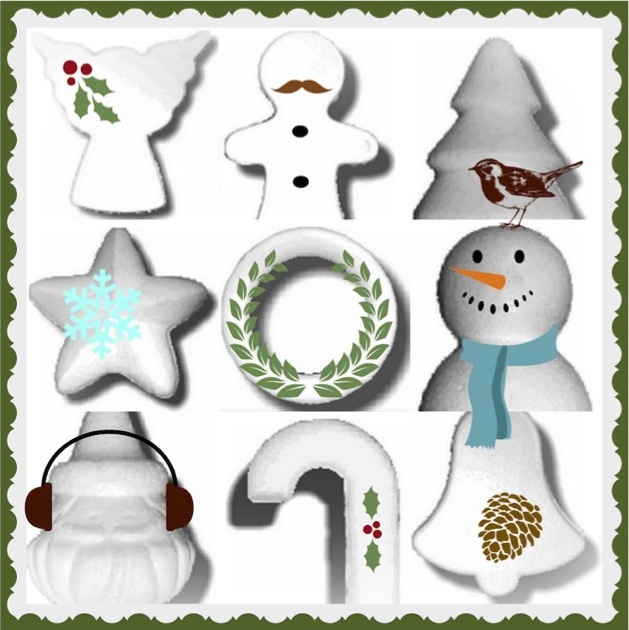 You can win a 6-pack of each of these nine holiday shapes – so much fun to paint and embellish to create ornaments, wreaths, garlands and centerpieces. Tell your friends and good luck! 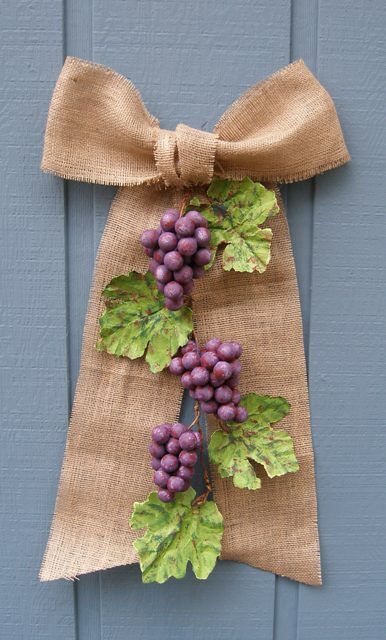 Hang this DIY grape garland on your door to celebrate the harvest. It could also be hung as a swag or used as part of your fall table décor. 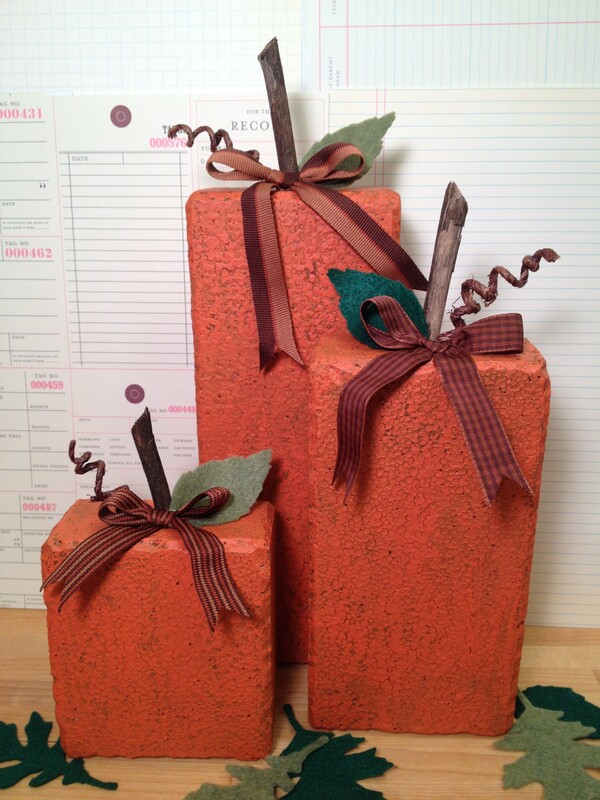 Learn how to make these fall themed crafts below. 1. Sand down the seams on the balls and paint them purple. For easier painting, insert bamboo skewer into pilot hole to use as a handle. Put skewers in a large canning jar to dry. 2. Glue one ball onto the end of a 12” length of wire. Glue the next three balls around the wire above the first. Continue adding rows until the bunch is the desired size. Cut off the sides of balls to fit into spaces if desired. 3. Add another coat of purple paint to the bunch and let dry, then dry brush it with patches of red. Mix purple with white and dry brush some highlights on each grape. 4. Cut the sheet of green cardstock into quarters. Fold a quarter in half and tear out a heart shape. Tear away small portions to form a leaf shape. Wrinkle the paper and unfold. Add green paint with sponge or dry brush. Glue a 6” length of wire to the back of the leaf for the stem. 5. 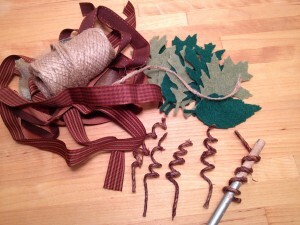 Cut a piece of wire to the desired length for your garland and wire the grapes and leaves along it. Make a loop at the top of the wire for hanging and curl the bottom end. Make a large bow with burlap ribbon and glue the garland to it, pushing the hanging loop to the back of the bow. Fall is absolutely my favorite time of the year, but living in Florida leaves me wanting more cool weather, more changing leaves and more pumpkins! You can never have too many pumpkins! 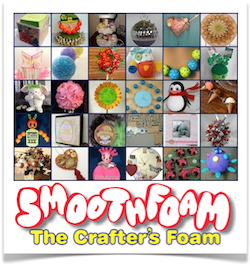 I am always trying to think of new ways to use products like Smoothfoam because it is so versatile. I discovered that trimming off the sharp edges and painting with a distressed technique turns the Smoothfoam into faux 2×4 blocks of wood. 1. Cut one 12″ block into a 3-1/2″ section and a 7″ section with the Hot Wire Foam Cutting Tool. Trim the second block to 9″ and trim off the corner edges from all three blocks. 2. Paint all three blocks with Dark Chocolate, set aside to dry. TIP: I use a sheet of Smoothfoam with straight pins inserted as a drying rack. 3. Paint the small and large pumpkins with Canyon Orange with a dry brush in random strokes to create a distressed look. Repeat with Tangelo Orange on the medium pumpkin and set aside to dry. 4. Cut three 6″ lengths of wire and wrap around a pencil, then remove, to create tendrils. Cut three leaves from felt. Cut three 4″ lengths of twig 4″ with wire cutters. Cut three 10″ lengths of ribbon and tie each in a bow. 5. To assemble each pumpkin – use a pencil to make a pilot hole in the top center of the pumpkin, squeeze in small amount of Tacky Glue and insert twig. Place a wire next to the twig stem. 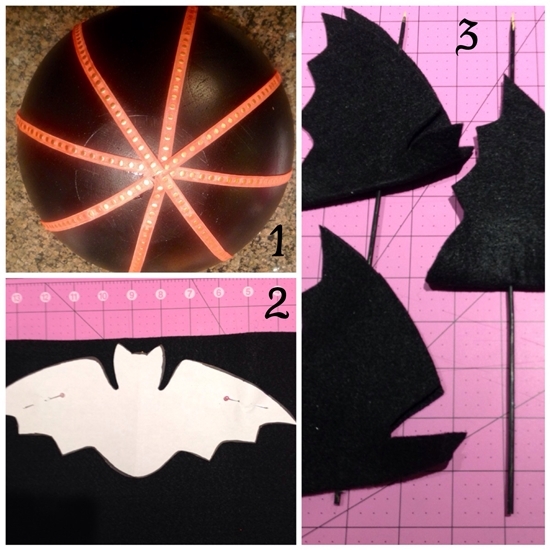 Fold a felt leaf in half and glue it with a ribbon bow to the top of the pumpkin. 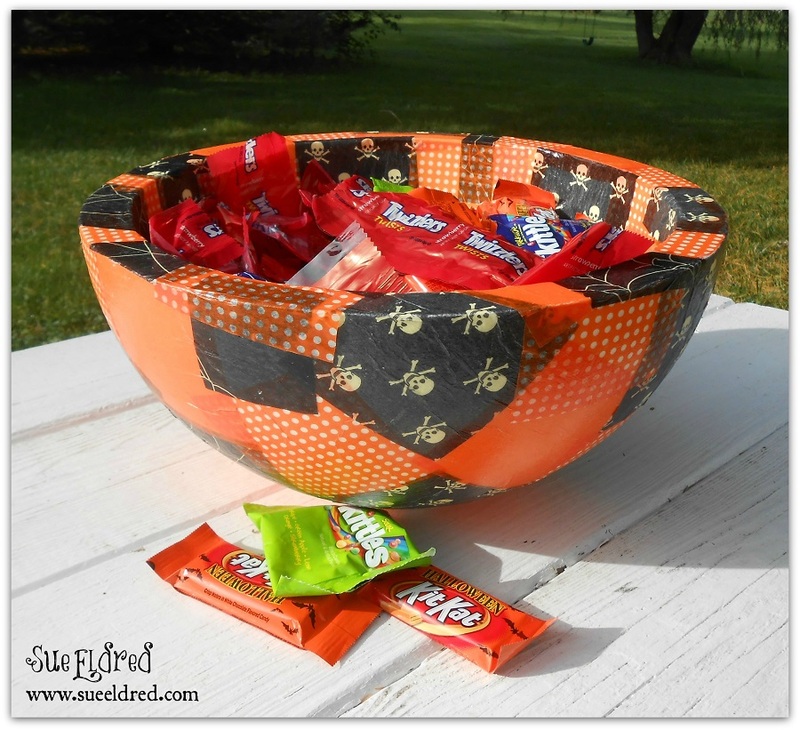 Another idea for a Halloween treat bowl for you today! This one’s decoupaged with some Halloween tissue paper that I’ve been hanging on to for just a special project like this. Cut the tissue paper into small squares. I started with 3″ squares and added some random sizes. Decoupage the tissue paper onto the half ball with Mod Podge. Tip: For my bowl, I started on the bottom and worked my way up. At the time, I thought was a good idea. By the time I got to the top of the bowl I was getting a little more random in how I placed my tissues. Next time I think I’ll start at the top of the bowl and work my way down. I really like the way the bottom turned out. Fill with treats and enjoy!